Imagine you are grocery shopping. You are standing in the cereal aisle trying to decide what to buy. You cannot recall your children’s favourite brand, it changes every week. Moreover, the elder prefers one type, the younger another type, and your husband yet another. You spot a new type, very sugary. You are sure your children will like it. In the end, you go for a healthy option—they may not love it, but it is good for them. Certainly, this scenario sounds familiar. Coordination issues are commonplace within the household. Household members typically make decisions in a sequential and decentralised manner, often not knowing other members’ preferences. This may arise because the consumption good offered is unfamiliar, or the decision maker does not recall the preferences of others, or because these preferences have changed. In other cases, individuals may believe that other household members will not act in their best interests—the decision maker may also know the preferences of others but deliberately choose to ignore them, either due to a paternalistic motive, or out of disregard for others, or because of a desire to impose one's will on them. Indeed, in experiments with rural households in Kenya, Jackiela and Ozier (2015)find women hide their resources from relatives and household members, even if hiding comes at a personal cost. When other members of the household cannot be relied on to make decisions that maximise collective welfare, individual members may seek to gain agency over household consumption choices that affect them (e.g., Glennerster et al. 2018). They may try to secure control over sources of income, production activities, or consumption purchases. To this end, they may demand that they be consulted on decisions made by others, or even take certain decisions without other members’ knowledge, in order to insulate themselves from others’ influence. Evidence suggests that the struggle for control over resources may not only lead to inefficient household decisions but also self-destructive and spiteful behaviour where individuals undercut their own income to reduce their spouse’s earnings (Mani 2011). This way of thinking about household decisions departs in important ways from leading models of intra-household decision making, which derive the prediction that households reach efficiency from assumptions of perfect information about household members’ preferences, costless enforcement of agreements between them, and benevolence (i.e., members make decisions that maximise collective welfare). While some studies have looked at the impact of asymmetric information outcomes (Ashraf2009, Woolley 2000), there is little or no literature investigating whether household members know each other's preferences, and whether they respect these preferences when making consumption choices for others. individuals have a demand for agency—that is, they are willing to pay for the certainty of getting the consumption bundle of their choice. We also test whether demand for agency increases with the risk of not getting one's choice, and the level of empowerment the subject has in the household. We design an original experiment to test these hypotheses, and implement it in three different ways with married couples from Punjab, Pakistan. In the experiments, we ask participants to select between distinct consumption bundles that they either have to consume on the spot, such as drinks or food (experiments 1 and 2, respectively), or personally use, such as leather items with their initials on them (experiment 3). We also ask them to guess what their partners would prefer to consume out of the available options, and to select a bundle for the partners to consume. 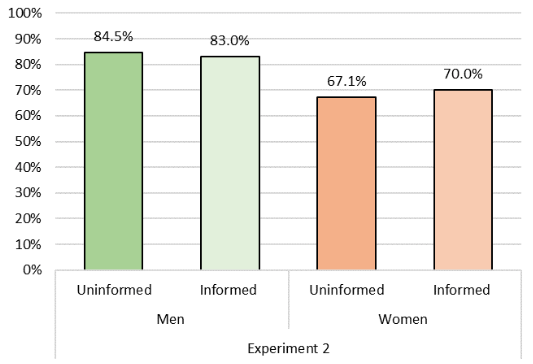 Experimental treatments vary whether individuals are informed of the partners’ preferences before making a choice for them; and whether the partner within the experiment is the spouse or a stranger. We find that a large share of subjects, more than 40% in experiment 1, are unable to guess the top or bottom ranked item of their family member. Participants are better at guessing the preferences of family members than of complete strangers, but not by much. We obtain qualitatively similar results from the second experiment (see Figure 1). Exerting agency over consumption therefore may have an instrumental value, because it allows subjects to consume what they prefer, rather than a different item selected by their family member. When not informed about their spouse’s preferences, only 71% of men and 53.7% of women select for their partner what they think she would prefer. Information on the partner’s preferences has little effect, as still only 56% of men and 50% of women pick the spouses’ preferred item when informed. Women who guess incorrectly do not adjust their choice once informed of their mistake. A similar pattern is observed in experiment 2 (see Figure 1). The fact that informed subjects often make inefficient consumption choices for others signals a demand for power, that is, a desire to make choices for others. Individuals not only prefer to hold power over others’ consumption, but also over their own. About 23% of subjects in experiment 1 and 26% in experiment 2 were willing to give up part of their earning from the experiment to make sure they are the ones who decide what they will consume. 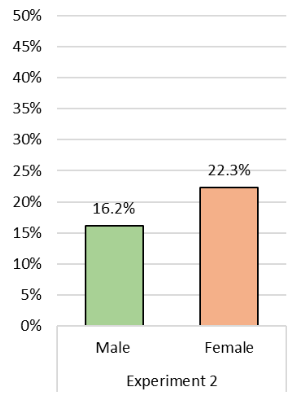 We see similar demand for agency in men and women paired with their spouses. For instance, in experiment 2 nearly 16% of the men and 22% of the women were willing to pay to make sure they consume their own choice, and not what their spouse may have selected for them (Figure 2). While instrumental motives can explain part of this demand, a significant proportion of participants (11%) are willing to pay for agency even after they are informed that their partner selected their preferred item. Some subjects thus appear to value agency for its own sake. We interpret our findings as evidence of a pure demand for agency – willingness to pay for executive decision-making power, regardless of the material consequences – and investigate whether demand for agency and power are linked to existing imbalances in intra-household agency. Decision power is unevenly distributed within households in our sample—women are significantly more likely than men to need permission from other members of the family to make consumption decisions, particularly for major decisions such as purchasing a durable good; and are significantly less likely to be consulted by others when these decisions are made. Our results show that women are more likely to demand agency than men. They are also more likely to exercise power—information on the partner’s preferences leads men, but not women, to revise their pick if it is revealed to be different from the spouse’s preferred item. Even more striking—women who discover that they guessed their spouse’s preference correctly, are, if anything, less likely to select that item! We interpret these behaviours as stemming from pent-up demand for agency among women, a result of lack of empowerment. We thus expect that increasing empowerment should reduce demand for pure agency. We confirm this insight using data from experiment 3, where randomly selected women in our sample had access to a microfinance product (similar to Afzal et al. 2017). Women offered the microfinance product are less likely to demand agency. Our findings suggest that the relationship between gender and decision making in the household is more complex than envisaged in theory. First, household members often choose to ignore each other’s preferences. Second, in a context that is strongly patriarchal, women are equally, if not more willing, to exert agency than men in the relatively safe and low-stake context of the experiment. A pent up demand for power and agency seems to be a manifestation of a lack of empowerment. The patterns we document are reminiscent of a recent study by Verschoor et al. (2017)who find that decisions between spouses became more private and less cooperative when, contrary to the norm outside the experiment, wives are given more control over resource allocation in an experiment. To a policymaker attempting to influence household consumption and welfare, these tendencies are deeply disturbing. They imply individuals with little say over household decision-making are willing to take inefficient decisions, such as paying to receive items they could have received for free, or forcing others to consume things they do not prefer. Reassuringly, our findings suggest that targeted interventions to empower women (and other members of the household) can reduce pent up demand for agency and power, potentially reducing inefficient decision-making in the household. Afzal, U, G d’Adda, M Fafchamps and F Said (2018), “Intrahousehold consumption allocation and demand for agency: A triple experimental investigation,” NBER, Working paper no 24977. Afzal, U, G d’Adda, M Fafchamps, S Quinn and F Said (2018), “Two sides of the same rupee? Comparing demand for microcredit and microsaving in a framed field experiment in rural Pakistan,” Economic Journal 128: 2161–2190. Ashraf, N (2009), “Spousal control and intra-household decision making: An experimental study in the Philippines,” American Economic Review 99(4): 1245–1277. Glennerster, R, C Walsh and L Diaz-Martin (2018), “A practical guide to measuring women’s and girls’ empowerment in impact evaluations,” J-PAL, report. Mani, A (2011), “Mine, yours or ours? The efficiency of household investment decisions: An experimental approach,” Competitive Advantage in the Global Economy, Online working paper series. Jakiela, P and O Ozier (2016), “Does Africa need a rotten kin theorem? Experimental evidence from village economies,” The Review of Economic Studies 83(1): 231–268. Verschoor, A, B Kebede, A Munro and M Tarazona (2017), “Spousal control and efficiency of intra-household decision making: Experiments among married couples in India, Ethiopia and Nigeria,” GRIPS, Discussion Papers 16-31, National Graduate Institute for Policy Studies. Woolley, F (2000), “Control over money in marriage,” Carleton Economic Papers 00-07, revised 2003.